This is where I write about the wood furniture projects, home and backyard decor that were on Billiam’s List, where we found materials, finishes we’ve tried, problems we’ve experienced and such. The Office Project is DONE! The office project has actually been done for a couple of months. I’ve just had too many other things going on to write about it. The battle with the local fauna has begun and it’s gotten ugly, the pool water reached a point where there was no alternative other than draining and refilling (it lasted healthily for 10 years so I can’t complain, even though I complained a LOT at the cost. I’d best find flecks of 24 karat gold in that water at that price. ), it’s weed season, a new planting season, and wind season. We also had a tragedy which took the wind out of my sails for a while and I’m still not over that yet, but here goes. 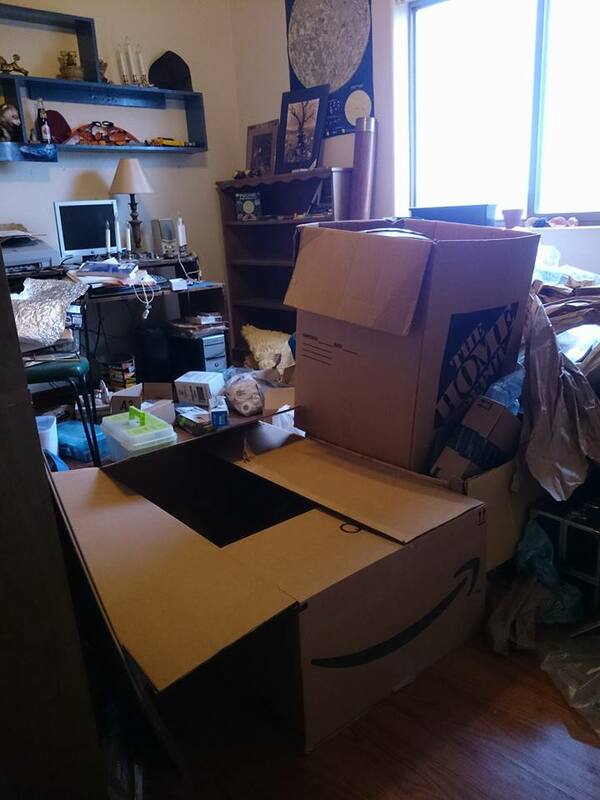 It’s been so long since I posted, I can’t start the reveal without reminding everyone what the office/storage/swap meet/ebay/junk room looked like before we got in gear. Other than packing up some of my husband’s things, we’d just closed the door on this room for 2 years and used it to store things we didn’t know what else to do with and couldn’t let go of yet. It was the junk drawer of rooms. I had been needing to do something constructive with it for 2 years. 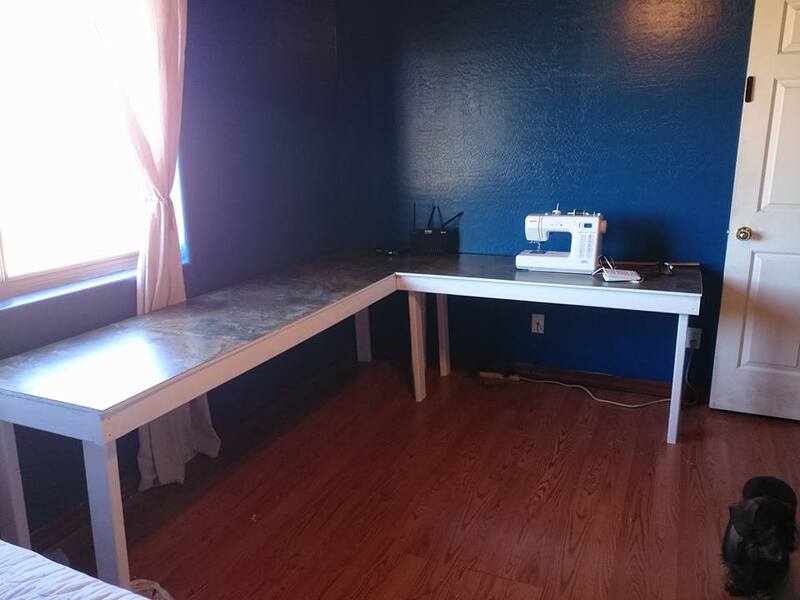 I decided during a previous Cure that I’d turn it into a Guest room/craft room/office, but still didn’t have the energy/heart to get to work on it. My brother had contacted me a year ago to let me know he was planning to come out this spring to do some hiking and wanted to visit for a couple of days. This was the boost I needed, but I still didn’t do anything about it until finally, three months before he was to be here, I was jolted into the home renovation version of last minute cram for finals mode. My son and I cleared the room of boxes, junk, furniture, and dust bunnies. 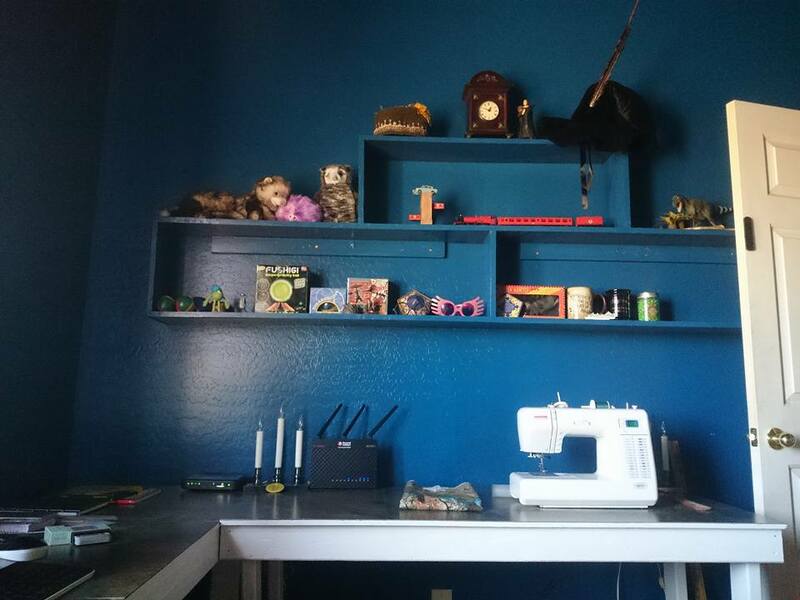 Starting from scratch we painted, pulled down the wall shelf unit from the north wall, repainted it the same color as the walls so my “stuff” collection would take visual priority, measured for a queen sized bed and craft tables, and built the tables. We bought 3 things for the room, other than cheap wood for the tables. 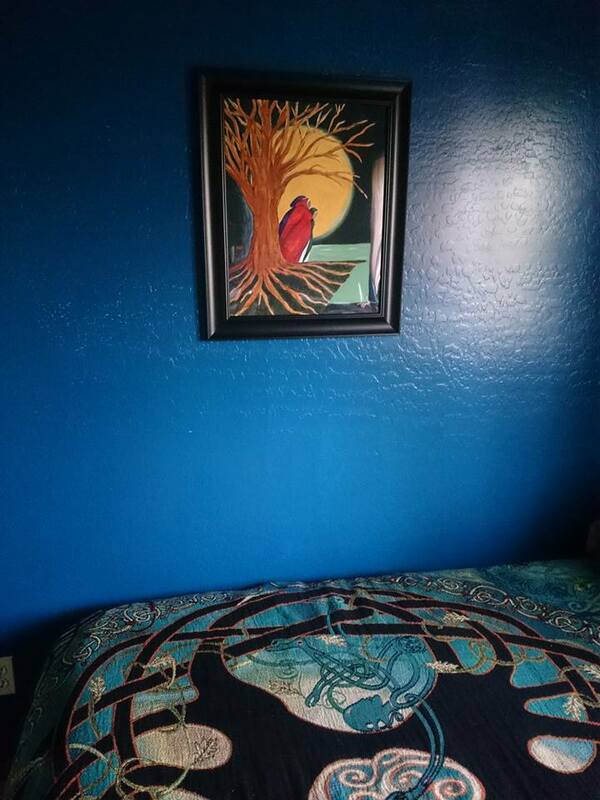 I ordered a bedspread, glass chimes and a fabulous painting done by my best friend. Then, we added the crafting stuff, computer stuff and my collection stuff. The result is a relaxing place to work, play and sleep. Guests can relax, work and play in here too. The way it is arranged is very wheelchair accessible. Eternity Tree bedspread from Pyramid Collection. 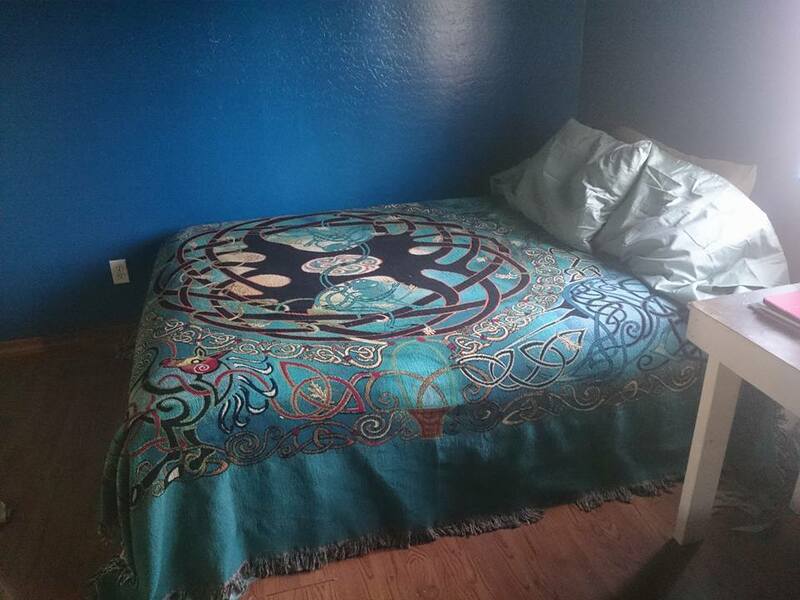 Years ago I had gotten their Tree of Life bedspread for my own bed and I’ve loved it. They are machine washable! 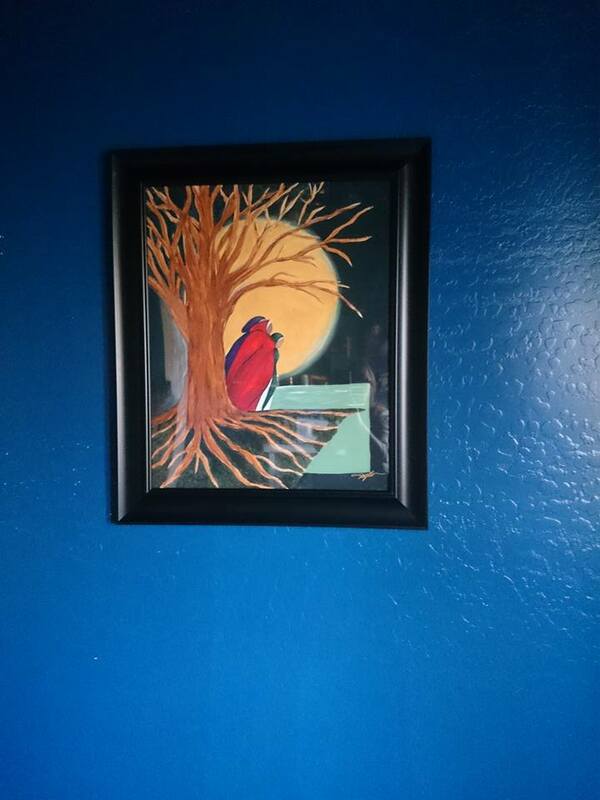 My friend Daphne MuShatt’s painting. She has many available, but I’ve always loved this one and it reminds me of Maiden, Mother, and Crone life stages. The colors in the painting and the subject suit this room, and my spirit, perfectly. Funny thing about those shelves William made many moons ago when we lived in town. 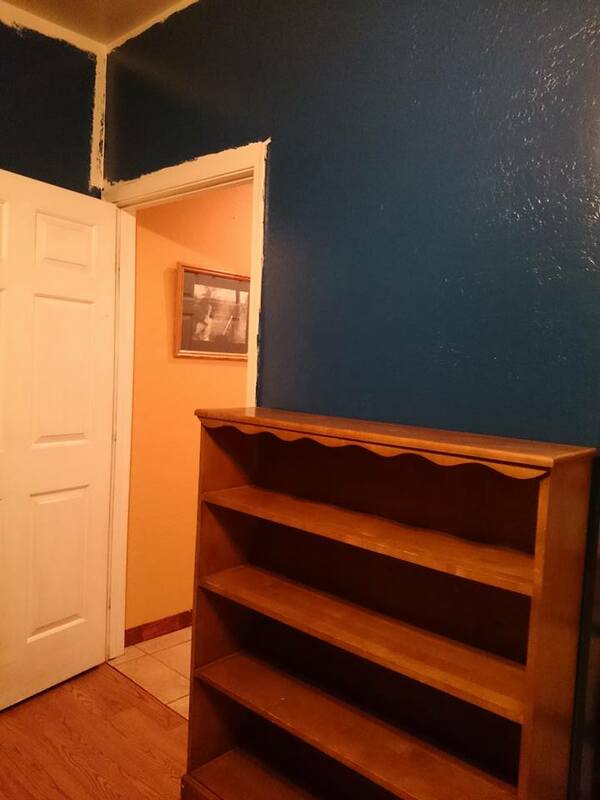 He’d decided on a paint color for his office (our living room) and painted the shelves to match so that the shelves would disappear and his History of Space Exploration models would stand out. The color he chose for that poorly lit room made you want to sing “Under the Sea” at night and swim laps through the living room. 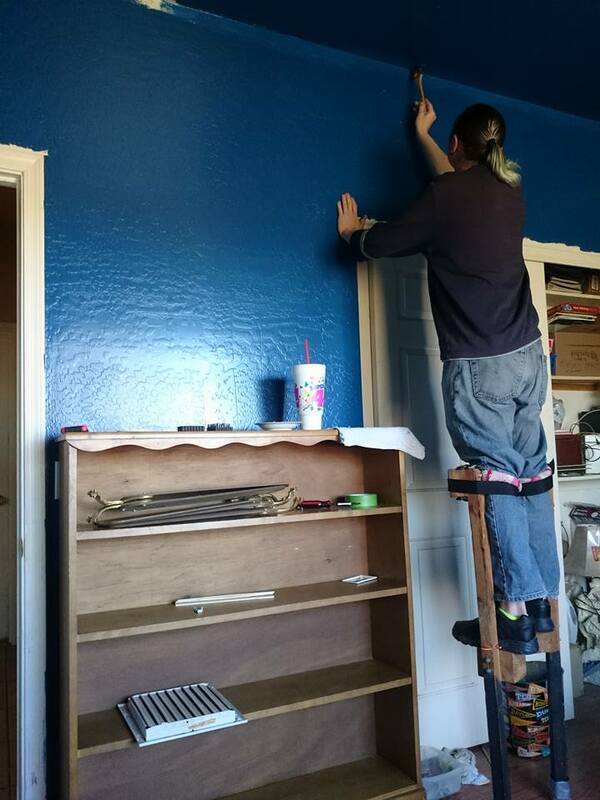 When I began repainting them to match the color John and I had chosen for this room, I was shocked to realize I’d picked that same color! 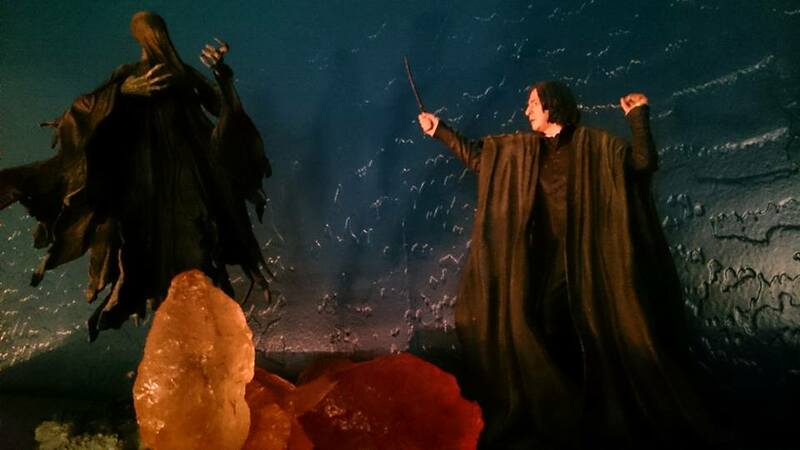 I was terrified I’d end up in another giant aquarium room, but turns out, lighting makes all the difference here. I still think William had a hand in the paint color choice though because we went in thinking we’d made our choice online and this color caught our eye at the last minute. The east facing office window. I watch the sun come up every morning with my coffee and Facebook friends and relatives. Those curtains were made with cheap cotton drop cloths and they were the first project for the new sewing machine. The glass chimes were ordered at the same time as the bedspread and also come from Pyramid Collection. The breeze coming through the window makes them sing prettily. My homemade incense drying in old glass tumblers lends a pleasant aroma. 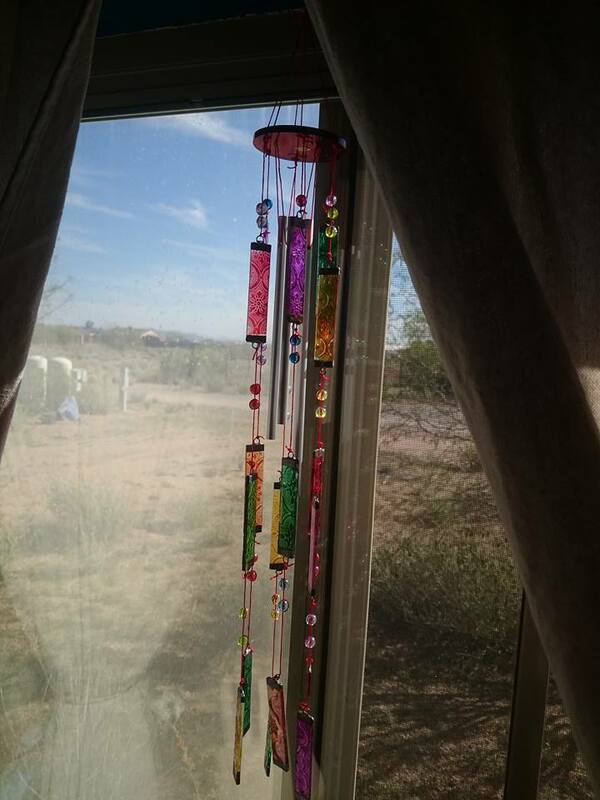 Just a close up so you can see the patterned glass and pretty colors in the chimes. Part of my Harry Potter collection arranged on the top of my bookshelf. Those “stones” were made by William about 5 years ago. 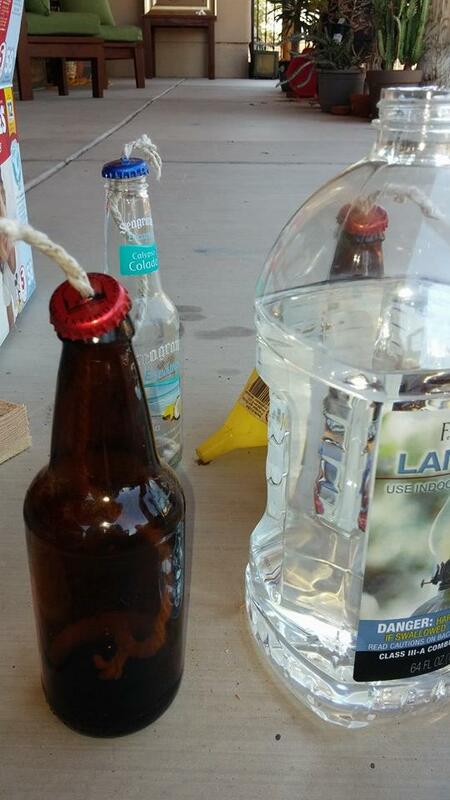 We were trying to make a Sorceror’s Stone for a friend of ours. The stones in the photo were some of the fails, but too pretty to toss. 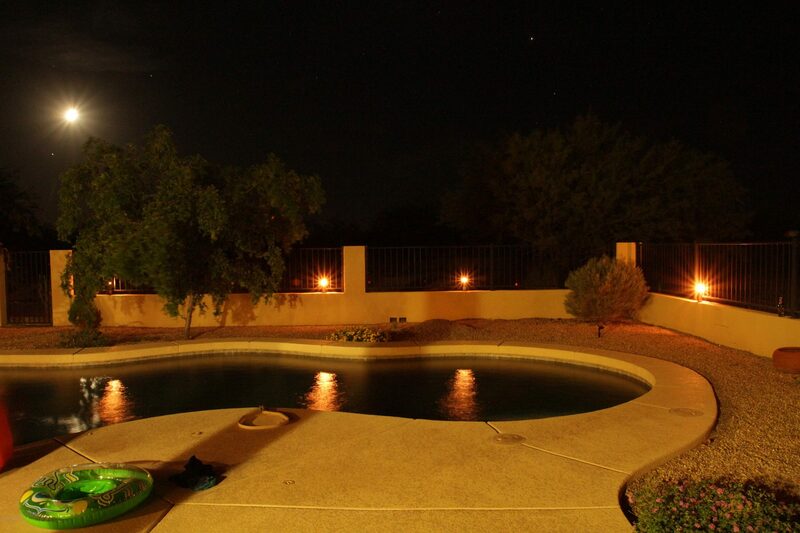 Unfortunately, my brother had to cancel his trip to Arizona, so I have a fabulous guest/craft/office available if anyone wants to come visit. Maybe if we add a microwave and a mini refrigerator I’ll just live in here. Yes, I know, I got so caught up in my office project part of the January Cure that I decided to drop the rest of the Cure projects and focus on the office while I was inspired. That room has been a major sticking point in my ability to move forward and for over two years I lacked the inspiration and will power to make real changes in there. When I last blogged about the January Cure I had managed to clear everything but the furniture out. I had laid out a plan for the swap meet items and I have stuck to that plan. If an item hasn’t sold in 3 to 4 weekends, it goes to Goodwill or the local charity Thrift shop. I’ve made a lot of room in the garage this way and I’ve also created room on my swap meet table for crafts I’ve made myself. 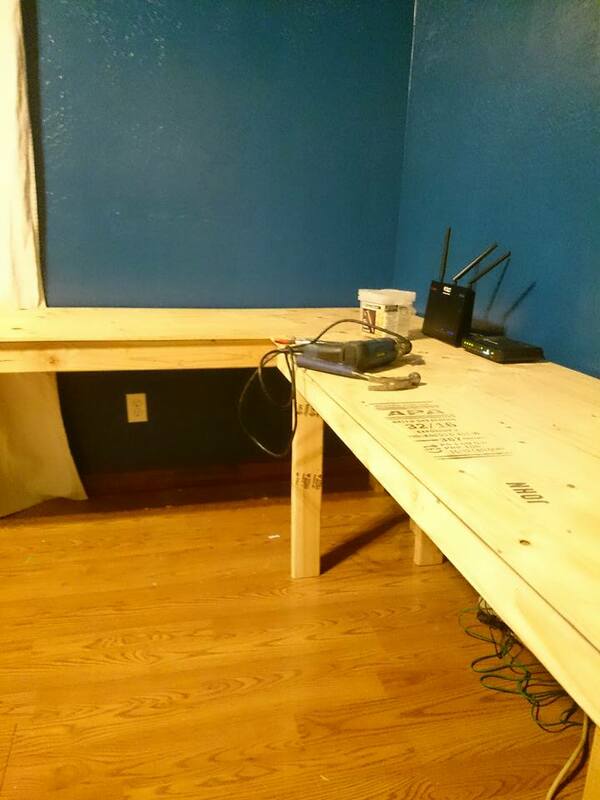 The room isn’t ready for a final reveal yet (hey, it was a massive project), but my son and I finished the big build of the long craft/computer desk. 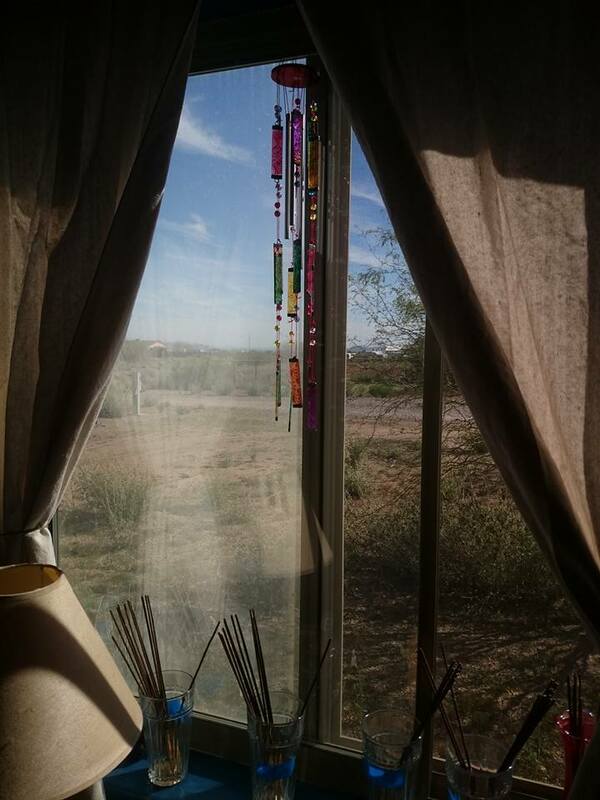 Once I moved my computer to it’s new spot, in a tranquil room, with a view by a window instead of the dishes in the sink, I felt like writing. So, here is what we’ve been up to on the project. Yes, we have a ladder. Apparently it is only useful for holding up the paint bucket, according to John who wanted to be practicing his stilt walking. My phone camera does not like to get a good picture of the wall color. It is dark, but it is most definitely blue, not black, not light blue, not green. It changes drastically according to the type of light and time of day and has appeared as many colors in my photos, just not the correct color. John started work on the long craft tables yesterday afternoon around 5:30. Here he was building the frame. We picked up eight 8′ 2x4s and a cheap chunk of half inch plywood. We had Home Depot cut the plywood to our specifications and John cut the 2x4s in our garage. 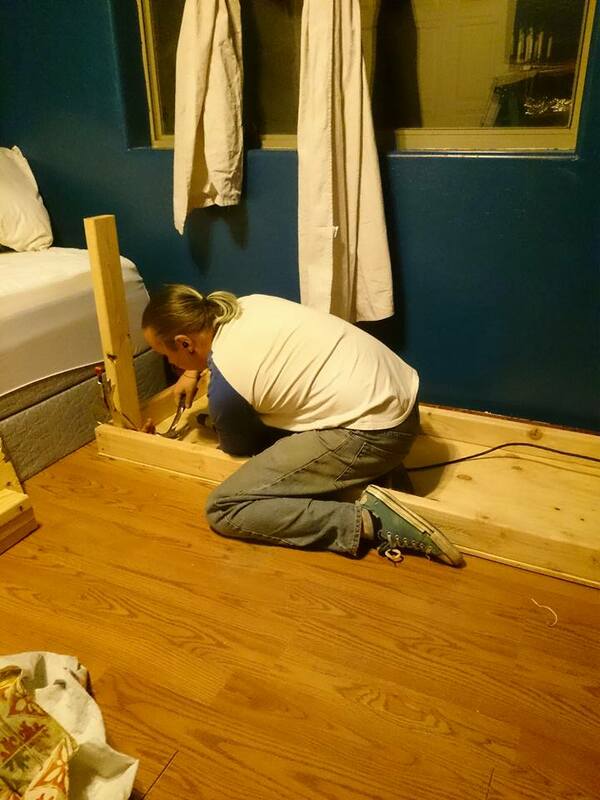 Within an hour he’d built the frames for both tables, attached the plywood table tops and had started attaching the legs. Within another hour the legs were on, the building was done and we decided the remainder of the evening would be spent watching Sherlock on Netflix. These are going to be crafting, sewing, painting, dyeing, inking, cutting and probably spilled on tables. 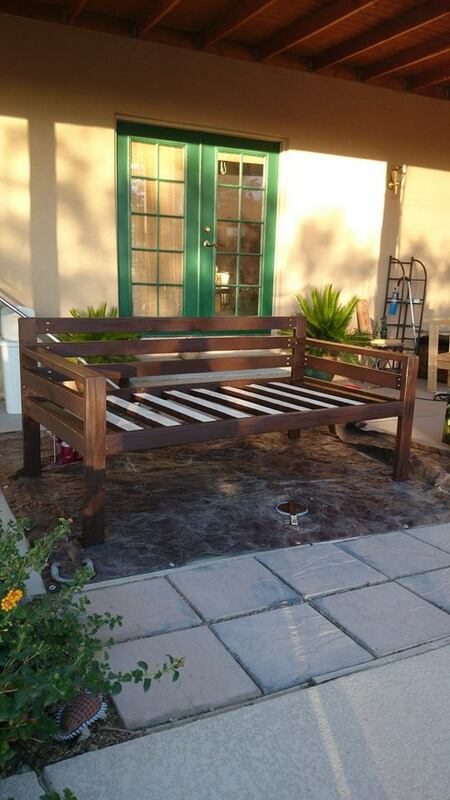 I didn’t want to worry about ruining a nice paint or stain job. I didn’t want to have to buy expensive wood to get a nice finish on that I would then just mess up with any of the above activities. 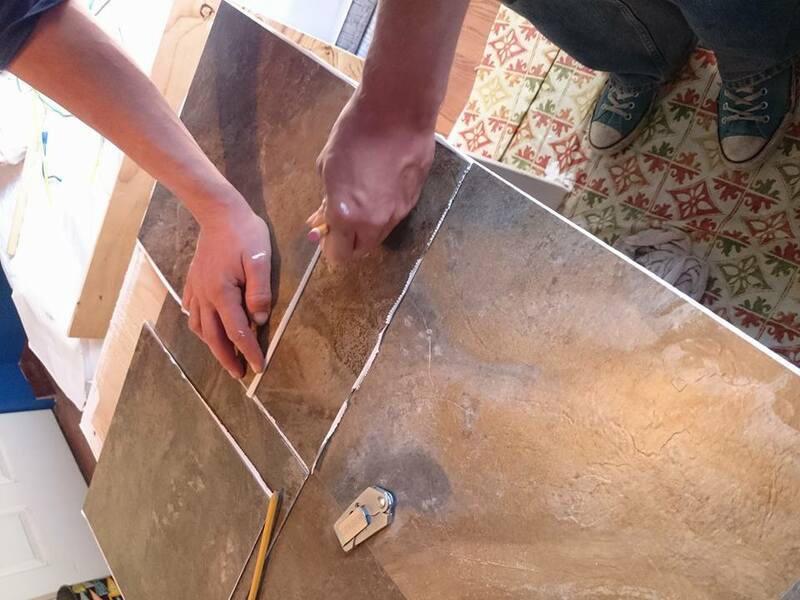 Good old linoleum peel and stick tiles to the rescue! We found lovely slate-like tiles that combine a rich, nutty brown and dark grey blue. I had plain white satin wall paint leftover from my door painting project a couple of years ago so I used that to paint the frame and legs of the tables. John cut the tiles to fit the plywood table tops. Voila! Two perfectly functional, attractive, crafting tables for less than $50.00. OH and see that sewing machine? See those curtains hanging in the window? John and I are learning to sew this year and those curtains were the first project. They’re just an inexpensive (and washable) cotton drop cloth. I’ve picked up some dye and will be dip dyeing them at some point, but they look fine just as they are for now. I still need to add my things back, make the bed, and hang the wall mounted shelf unit. However, if a friend shows up from out of town unexpectedly I have a perfectly functional guest bedroom. Well, you know, once I make up the bed, unless they want matching pillow cases. I finally got out of the house today. 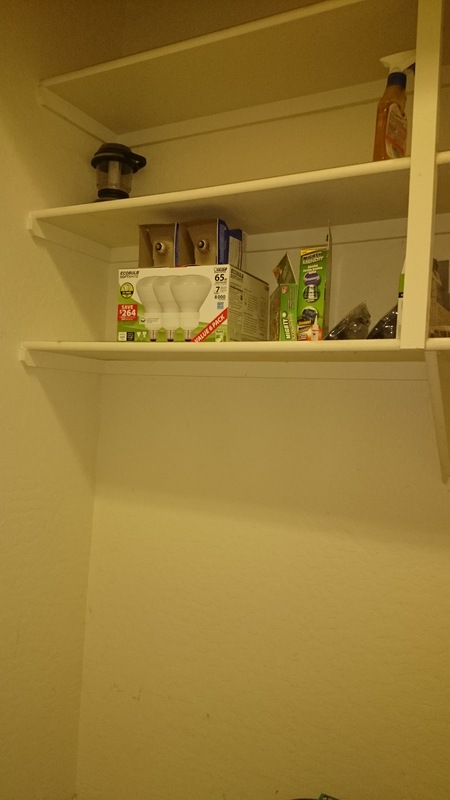 I’ve been trying to get the house fully in order where it can pretty much stay fully in order. This, however, is a long process and is about dull as dishwater. I’ve been itching to get outside and build something, ANYTHING. A couple of months ago I decided that the front porch needed a table and a couple of chairs. 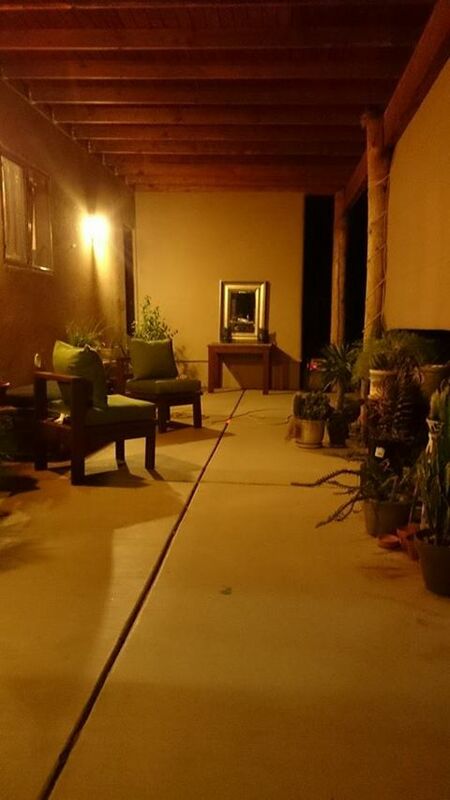 The big back patio faces west and is just too hot to enjoy for about 5 months out of the year. Once the sun moves over the house, the back patio starts heating up and I could bake stuff out there by 3:00pm. Gosh knows John and I have baked ourselves pretty thoroughly out there trying to get projects done last summer. 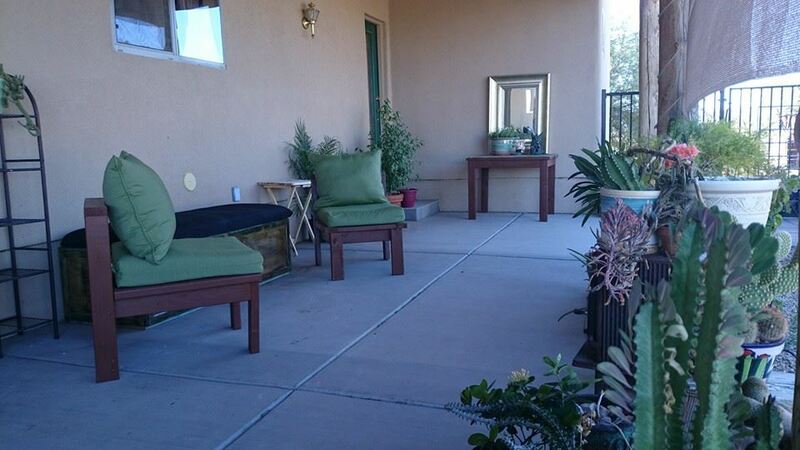 Thus, the front porch will be our go to spot for bbqs and such. I can even clean up the old grill and put it out there. Add a few plants and make it a spot I’ll actually remember to use. I’m pretty sure the front yard landscaping would appreciate it if I remembered it more often. I had John cut the wood for the chairs back when I thought of this project, but then got side tracked by an intense month of house keeping and organizing. The past two days have been so beautiful that I just could not stand to work in the house again today. I needed sun, blue sky and creativity before I went berserk. 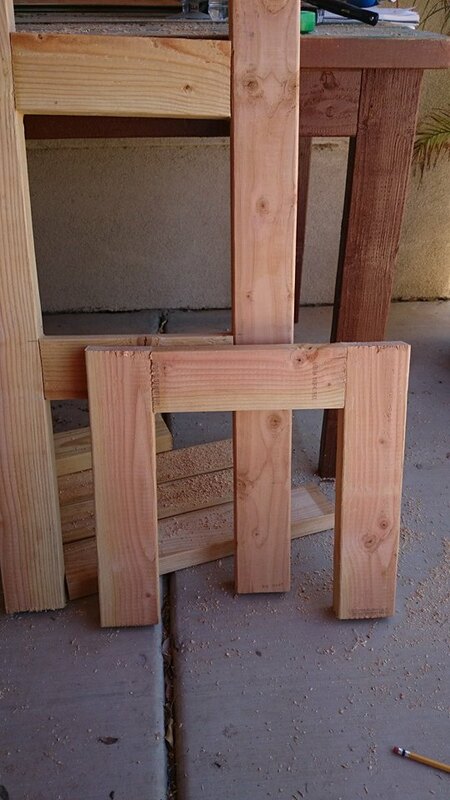 Here are the cut pieces of 2×4 for two chairs. Right where they’ve been sitting for over a month. Yup, the cute work table we used all last summer before we finally painted it and made it a part of our patio decor is being pressed into service as a work table again. I pre-drilled pocket holes in the chair back boards, front apron, side boards and support board. While doing this I had the first inkling of problems caused by not getting around to doing this for over a month. The wood was damp and devilishly difficult to drill because the bit kept getting clogged. I finally got it done though and began putting the chair together. This is where I noticed problem number 2. 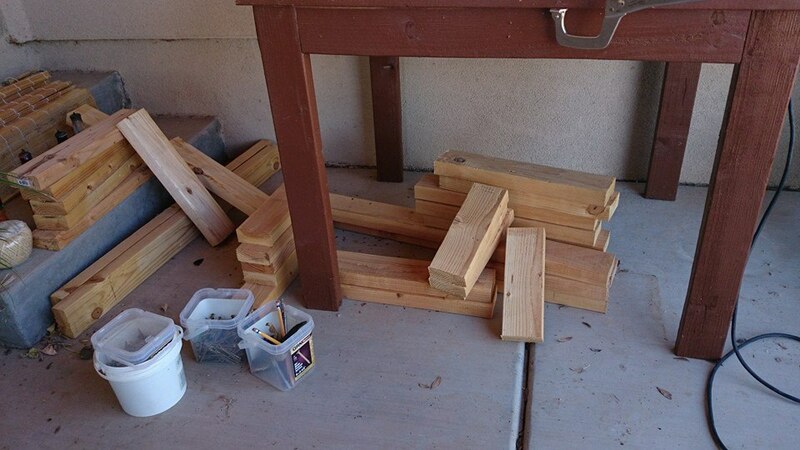 I had disregarded my rule of using lumber within a day or two of purchase. 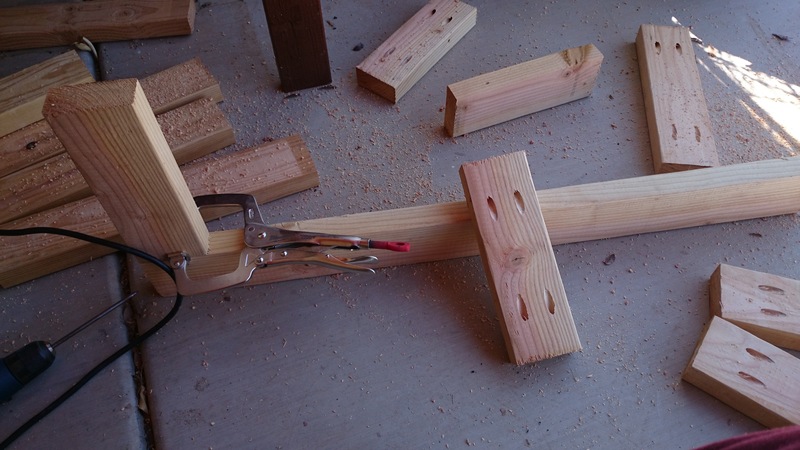 No matter how straight a construction grade 2×4 is when you buy it, it can warp, bow and twist while waiting to be used. I had actually thought of this and had John go ahead and cut the pieces the day after we brought them home. Then I put off building the chairs, thinking the cut pieces were too short to bow, warp or twist. Wrong. The job was more difficult than it had to be, but it’s rustic right? Rustic is a great rationalization. Clamping the back boards to one back leg, the job was fairly easy until I had to attach the second back leg. That’s when I noticed slight twists in those tiny short 13″ boards. This would mean that I could line them up perfectly with the 2nd back leg but the twist in the short back boards would make the leg slightly crooked. Rustic. That’s the ticket. Next on the assembly list is the chair front. The front apron wasn’t too deformed so attaching it to the front legs was ungainly, as usual, but not difficult. 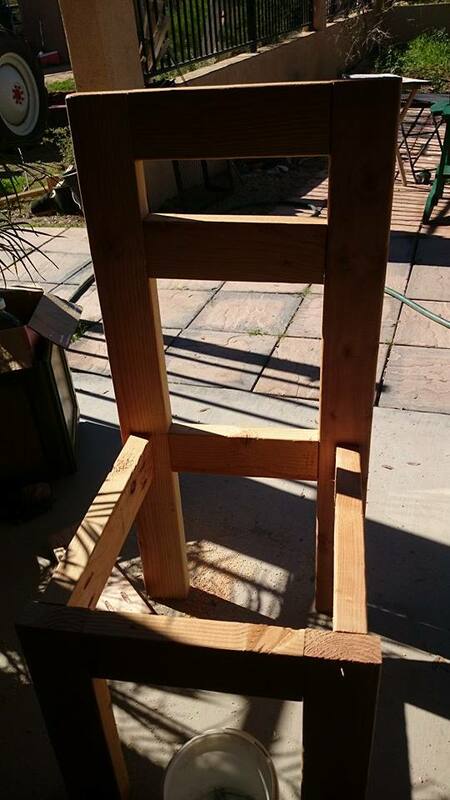 Once the front of the chair was built and I leaned it up against the back I noticed problem 3. The plans were off by about 1/2 inch. The lowest back board, back apron board, was 1/2 inch higher than the front apron. Not quite enough slant to slide a guest onto the ground, but enough to make them feel like they would. The back apron had to be unscrewed and moved down so that the seat would be level. Then it was time to add the side boards. The plans said to attach the side boards 1/2 inch from the outer edge of the legs. I measured and marked the spots. These boards also needed to be attached flush to the top of the front legs and even with the top of the back apron. Voila! 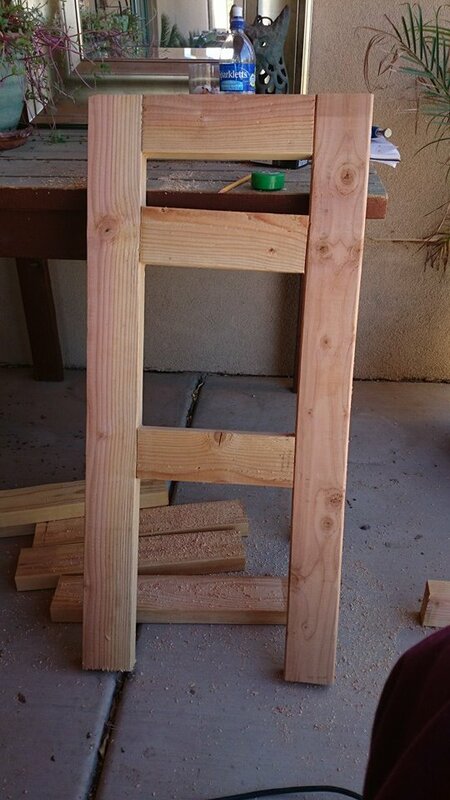 A chair frame. This was when that slightly crooked back leg began to neener me. Because that one back leg was slightly crooked, the chair wobbles slightly. Rustic. That’s what it is. Next it was time to screw in the extra seat support board. This board needed to be attached flush against the back apron board, between the two side boards. It didn’t fit. It was, guess what, about 1/2 inch too long. Either the side boards needed to be removed and attached at a little less than 1/2 inch from the edges of the legs or the support board is going to have to be cut again. These are 2x4s. No one is going to fall through them. I’ll recut that support board at some point, but not today dammit. Next, the three middle seat boards needed to be attached to the front and back aprons. You have NO idea how joyful I was when all three boards fit neatly, and without argument, through the opening in the back. If that measurement had been off I might have just had a bonfire at that point. Next it was time to add the side seat boards. This is where that slightly crooked leg gave me a full on raspberry. One side seat board was lovely and even with the three middle seat boards. The other, not so much. We have a jigsaw. Nuff said. 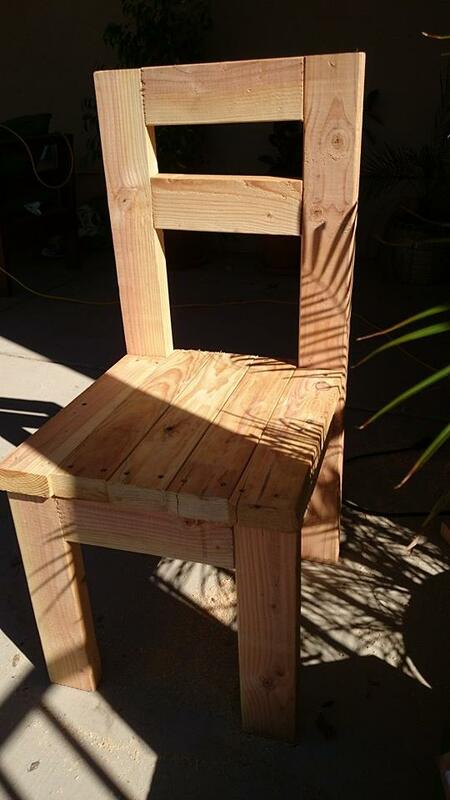 If you build this chair, it might be wise to build the front of the chair first. This way you can be sure that the back apron is attached at the same height as the front apron. Also, before attaching the side boards, place the seat support between them and mark where the outer edge of the sides strike the legs. 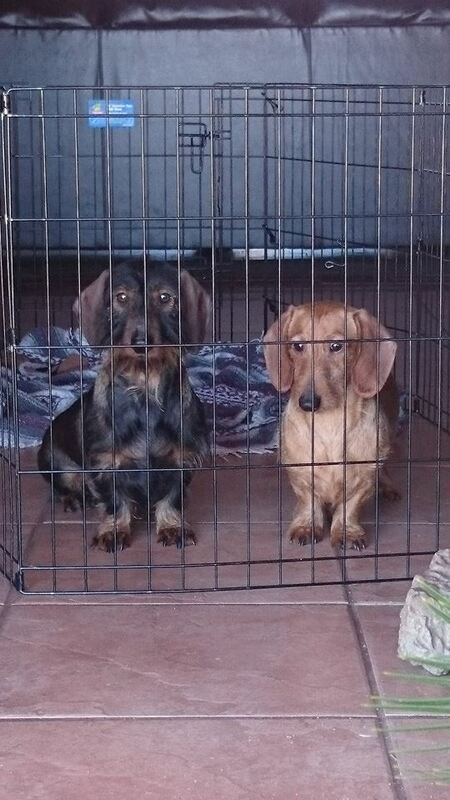 The dastardly dachshunds were jailed by the open back door. They just don’t understand why their help is not appreciated. The blank pallet we’ll begin to fill today. John is off today so we’re going to see just how fast we can get some major building done in the laundry room before he leaves to meet his Juggling Club in the park tonight. There are two big things I’d like to accomplish today. 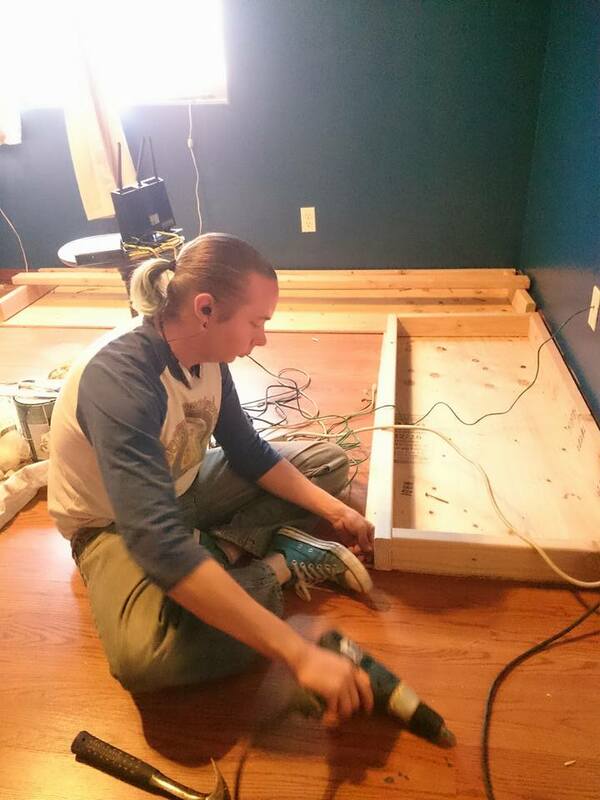 We’d built a Day Bed early on in our building spree last spring. Actually, it the plan called it a simple modern sofa but it’s so huge it’s actually a Day Bed. I’ve no use for a Day Bed. I also don’t want to waste all that wood. So today will be spent taking apart the Day Bed and turning it into a narrow table that will fit in the laundry closet. 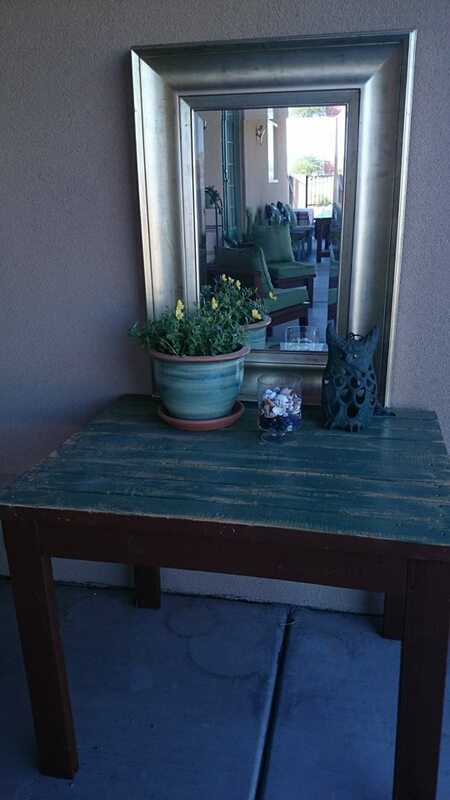 My original plan was to turn it into a small table for the front porch, but that will have to wait. 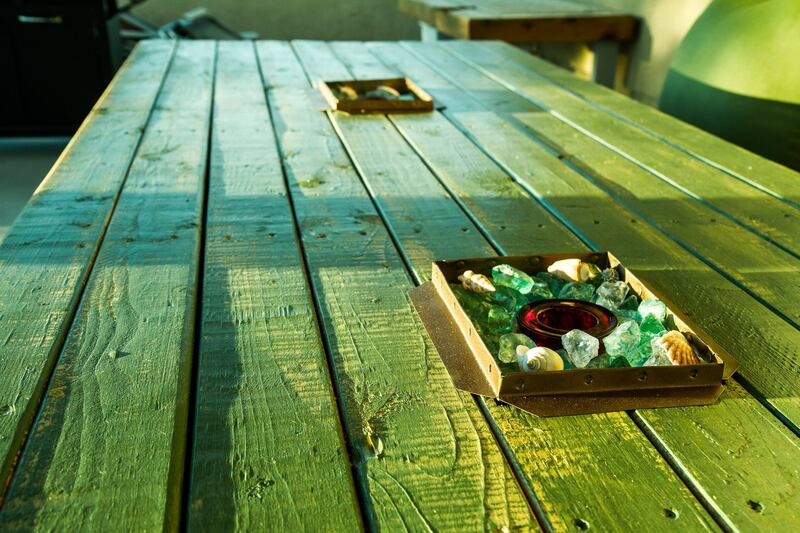 A table for the porch is just fun and decorative, while a place to hold small appliances is urgent. The Day Bed we will be deconstructing today. Yesterday I’d picked up a bunch of inexpensive wooden crates to store cleansers that I don’t need on a daily basis, extra sponges, light bulbs and small repair supplies. With the supplies neatly corralled and easily removed, and while John is taking apart that Day Bed, I’ll be painting the laundry closet. 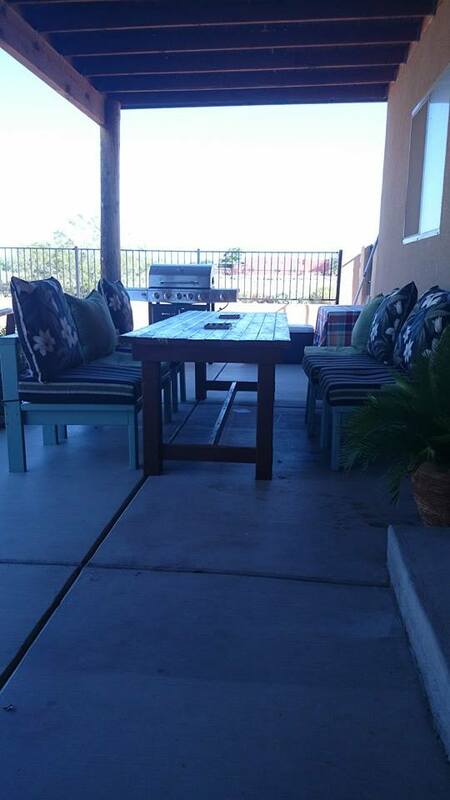 If y’all have kept up with other parts of my blog and have seen the patio furniture and other items we’ve built, you’ll know I love rustic. The all black, white, grey IKEA spartan look is just not me. I’m a Hobbit. So, the narrow table we’ll be building for the laundry closet will be painted to look old, much like we did our patio tables. 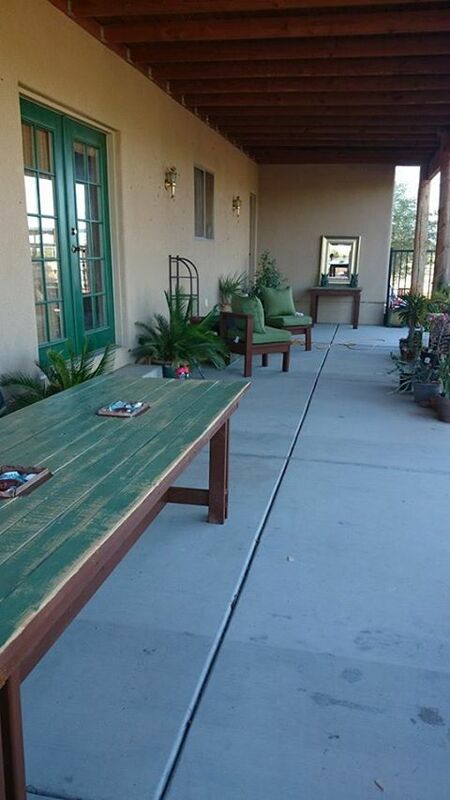 The rustic look patio tables we built will be the look for the laundry table. While John is deconstructing the Day Bed, I’ll whip up a cut list for the table so that he can go straight from deconstructing to constructing. 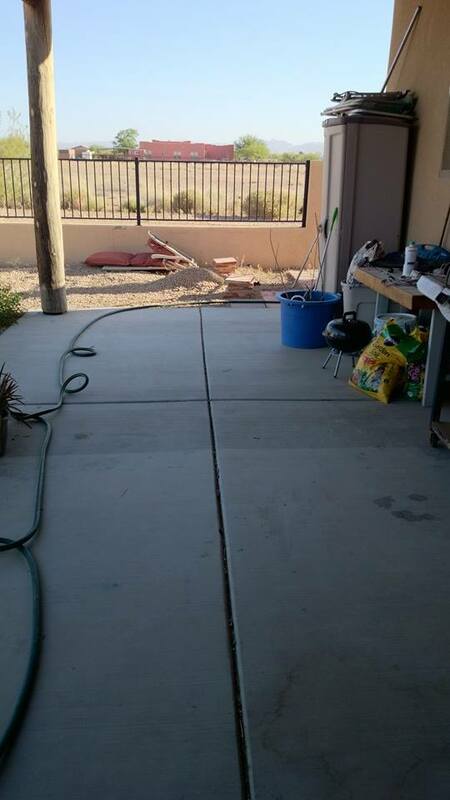 I don’t have a ready made plan for this, but we built so much furniture last summer to fill the patio and backyard, that I’m confident I can do this. We have a fairly limited amount of time, less than 8 hours, and two overly helpful dachshunds, so I’d best get out and get the ponies fed so we can get started! Time to crank up the Ride of the Valkyries, yes, to eleven. Billiam’s Backyard and Patio Reveal! First of all, I need to thank John. Without his help some of these things could never have been accomplished and the rest would have taken me two years instead of 6 months. 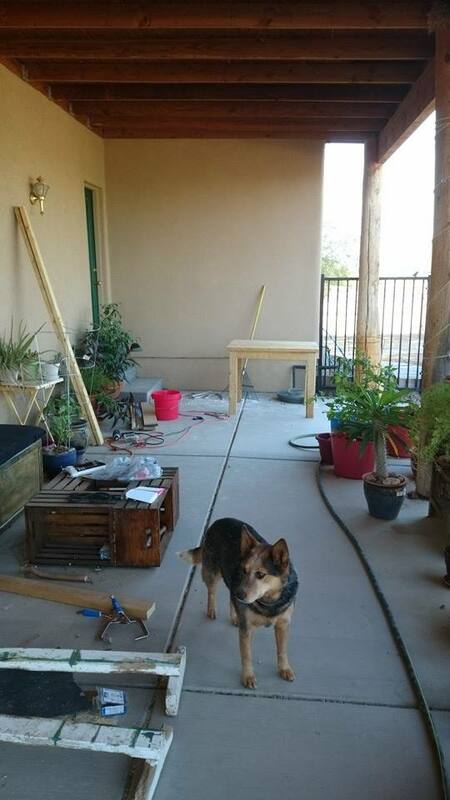 Secondly, I want to thank Ana White for the inspiration to Do It Ourselves, and the little family at More Like Home for adjusting some of the plans on Ana’s page so that the projects could be built with 2x4s and for their other 2×4 projects. Thank you to the Apartment Therapy and Houzz sites for their daily decorating inspirations. Thank you to the guys at Articulate Motion for keeping us in pallets, donating a chunk of fabric, and adjusting the metal fire inserts so that they could be used in the dining table. 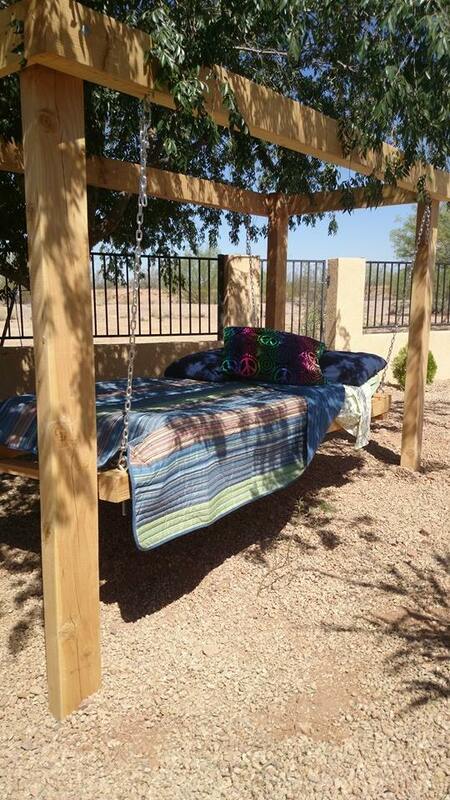 I want to thank the DIYers out there who showed us how to make Beer Bottle Tiki Torches and inspired our hanging bed. Speaking of that hanging bed, I want to thank the wood gurus at Home Depot for putting us on a safe path on that journey. Finally, thanks to all the friends and family who cheered us on and helped us through this traumatic year.